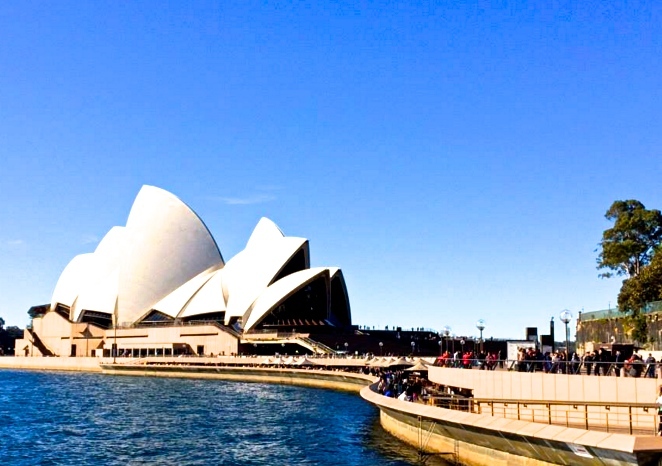 The Sydney Opera House, a UNESCO World Heritage site, opened in 1973. Connected to the southern side of Circular Quay by a walkway, the Opera House was designed by Danish architect Jørn Oberg Utzon. Circular Quay is the hub of Sydney Harbour, and it is located on the northern edge of the Sydney business district. It is a popular area due to the numerous attractions here as well as being a transportation hub. In addition to the Sydney Opera House, the The Sydney Harbour Bridge and The Rocks are all located in close proximity of Circular Quay. Circular Quay was the site of Australia’s first European settlement in 1788. Non stop flights to Sydney (Airport code: SYD) are offered from both San Francisco (SFO) and Los Angeles (LAX). Flight duration is approximately 14.5 hours from both of these California airports. Direct flights to Sydney are also offered from several other cities, including, but not limited to Dubai, Bangkok, Hong Kong, Abu Dhabi, Singapore, New Delhi, and Kuala Lumpur. Once in Sydney, visitors can easily use public transportation, as the train system is well organized. You can either take the train straight to Circular Quay, or take the train to Central, then transfer, and take a quick ride to Circular Quay. Once you get off the train at Circular Quay, you can immediately see the Sydney Opera House to your left, and art museum to your right. Pick up an Opal Card when you arrive in Sydney either are in the train station or the airport. The Opal Card essentially works as your ticket for any train, bus or ferry in the New South Wales transportation system. Get a free card, load money on it, and tap on and off of every train and bus throughout the city. It is cheaper than purchasing a ticket for each trip, and some buses only accept Opal Cards, so it really is a must for your trip to Sydney. Circular Quay is open all year, and is always bustling with people. Keep in mind, Australia is in the southern hemisphere, so the seasons are opposite to the northern hemisphere. For warm weather, take a vacation during Sydney’s summer from November to March, when the high is in the 70s (24-26 degrees Celsius). Fortunately, Sydney has mild winters, from June to August, and the low rarely drops below 40 degrees (5 degrees Celsius), with the winter averages being in the low 60s. Visitors can take a cruise around the harbor to enjoy a great view of the opera house, and thrill seekers can climb Harbour Bridge. The boat tours can drop off visitors in various locations, including Darling Harbour and the Toronga Zoo. You can also tour the Modern Art Museum for free. If visiting over a weekend, go shopping at The Rocks Market located right behind the art museum. Also, remember to tour the Sydney Opera House and attend a performance. For a bite to eat, stop at one of several restaurants and food stands along the quay to sit, eat, and enjoy the view. Thanks to travel expert and blogger, Liz, a student at Macquarie University in Australia for sharing her travel tips on Sydney!